We’re solar energy fans, and we like to harvest power direct from sunlight. But, with wind power systems picking up headlines, we though it was time to check out the other big ‘alt. energy’ story. For more, see wind energy facts. Windpower is thousands of years old. Humans have been harnessing the wind to grind corn and pump water since the beginning of history. But the idea of using it to generate electricity is pretty new. 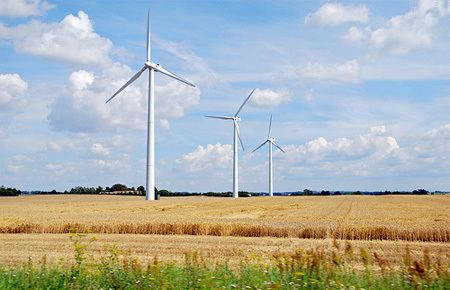 The first wind turbines showed up at the end of the nineteenth century. In essence, the mechanism works just the way you’d expect — you take a windmill, and hook it up to an electric generator. But things aren’t quite that easy in practice. For a start, there’s the problem of speed control. Windmill engineering is easiest at low speeds. (Start spinning 50ft sails at high RPM and you’ve got a maintenance issue — and a potential hazard.) But generators are most efficient at high revs, and give their best performance over quite a narrow range of speeds. So, an effective wind turbine needs a gear system to keep its generator ticking over at the correct RPM, regardless of wind speed. It may also need aerodynamic controls to adjust the shape or angle of the turbine blades so as to make the most of available air currents. This leads us on to the complex issue of scaleability. Photovoltaics can be made to work at any size — you just use as many, or as few, solar cells as you need. But making an optimally efficient wind turbine for a given application requires skilled engineering and lots of planning. Right now there’s a lot of development effort on small vertical axis wind turbines. These are the devices you can sometimes see attached to the roofs of office buildings. They can be designed to regulate their output automatically and to control their blade speed with various clever cheap gadgets, making them first choice for the home installer, almost as easy to deploy as solar panels. But, for the big utility companies, large, efficient, high-ticket horizontal axis turbines are the way to go. These are the ones that you see in the newspaper stories, looking like oversized airplane propellers attached to lighthouse towers. And communities aren’t always positive about having these big, noisy structures in their midst. Unfortunately, wind turbines are likely to keep hitting the headlines — for the wrong reasons. 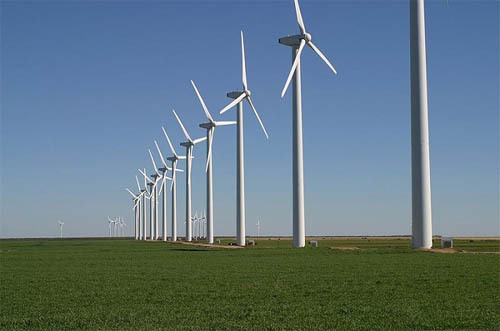 Leave a comment on Wind Turbines – How do they Work?